Let’s focus on those things which are important. Also, one should also know about what a photographer goes through in order to make an educated decision. 1. How do I choose the best photographer from the basket of options? First start looking at several photographsvin the web and facebook from different wedding photographers. Once you do this, you will know what photographers give and you can start shortlisting the kind of photographs that will match your needs and preferences. Once you've a shortlist of photographers, narrow it down to a handful of favorites, and set up a time to meet them. Make sure you're meeting with the person who will be wielding the camera at your wedding & editing your photographs, not a sales guy or studio owner. You have to, like, trust and get along with your photographer — that way you can leave the magic of photo making in the photographer's hands. Not only should you like their images, you should also like them! You'll be spending many hours with them during the course of your wedding. 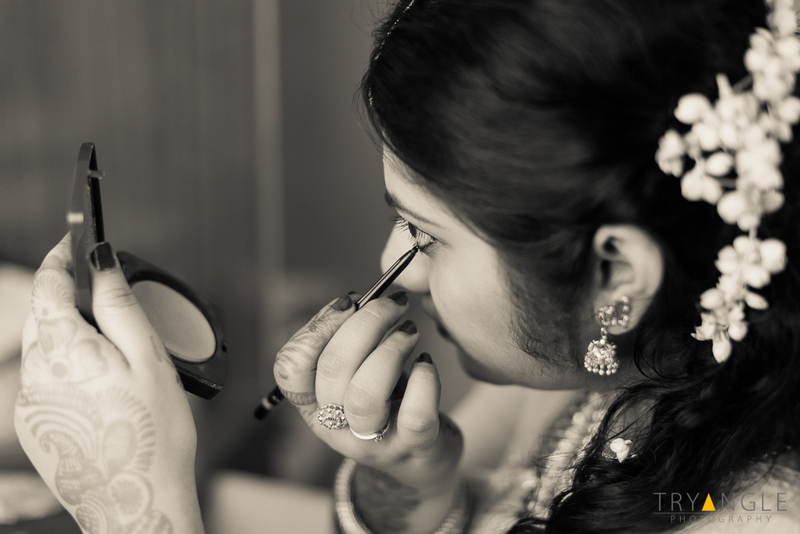 A typical candid wedding photographer gives about 150 photographs per event. Three hundred photographs may seem like a lot, but your wedding photographer is preserving all those little details and the moments you missed while you were mingling. Also, if your family insists to have record shots of the stage, do have a traditional photographer who will give those a fraction of the price of a reportage wedding photographer (candid). The traditional photographer will end up giving another 600 pictures from which you may pick about 200. 3. I love those photos with the soft blurry backgrounds. How do you get that look? You're talking about shallow depth of field. Photographers get that look by using professional lenses that open wide and are able to focus tightly on the subject. Grooms dress ironed by his friend. It doesn't matter which style you go with, as long as you love it! You may like to tell the photographer about your preference before he edits. This is the question I get every day. Wedding photography seems like easy money — work for a couple of days and rake in the cash, right? But most full-time wedding photographers I know carry over Rs 6 Lakhs worth of wedding gear and often work 60 hours a weeks. (Remember those 300 images from question #2? It takes several full days just to edit those.) Add taxes, software, computers, advertising, albums, repair, shipping, and studio expenses, and many photographers end up making less than minimum wage for the first few years of their career. Good photographers are artist at heart, most people do it as passion. Today we have people with varied experience and qualification whoe have resorted to photography as it is their passion. Relax… Be yourself…Trust your wedding photographer. If you're cool, it'll come through in your photos. Old Malayalam scriptures on an attic, shot at grooms native place. Leave some breathing room in your schedule so you don't feel rushed — I recommend a minimum 30 minutes for family and wedding party photos, and an exclusive outdoor shoot of couples on a relaxed day. Please do not combine couple portraiture with your wedding or reception. 7. I keep hearing about "exposing" photography. Sounds painful. What is it? It happens in wedding... Its all fun! Actually, yeah, it can be kind of painful. "Shoot and burn" is slang for photographing a wedding and burning it straight to CD without post-processing. It's usually super cheap — for a reason. Bad lighting isn't corrected, distracting elements aren't removed … The photographer doent bears any responsibility for his images. Digital files may be important to you, but find a full-service photographer who will edit the images and print reference proofs before handing over the soft copies. And please, don't let the digitals rot on your hard drive. As a photographer, I want you to proudly display your wedding photos. It makes me sad when I think of all the photos that never get printed. Don't hide your wedding photos! I tell my clients to hang up a large print ort wo — when you're having a crappy day, it's great to look up in your living room and see a photo of an awesome day. 8. Should we do a "first look"? And, um, what the hell is a "first look"? A stretch after the wedding at Guruvayoor. A second photographer can provide you with more images and a different perspective. Many of the top photographers only work with assistants who carry gear and help with professional lighting. If you need on stage pictures, it is better to hire a separate traditional photographer. A cool group shot a Wedding Reception at Hyatt, Chennai. Many in-demand wedding photographers are booked even before 6 months. As it gets closer to your wedding date, it will be harder to book your first-choice photographer. So the faster, it is better! If your favorite photographer is unavailable on your date, don't panic. Ask them for recommendations — they will definitely recommend a photographer with similar style and a lighter schedule. It depends. As a photographer, I want to get everything as perfect as possible in camera. Posing, location scouting, and camera settings can "fix" most things before I even click the shutter. It's much easier to get the photo right than to fix it with Photoshop. Nevertheless, digital photography workflow is incomplete without post-processing. It is at this stage where the colour and presentation comes. And a good editor can make artistic coffee table book. Insist of getting good photographs as blown-out prints with minimal design elements… Trust me, they look gorgeous. 12. What motivates a photographer to give good photographs? Love him… Respect him… Listen to him and be cool… A photographer needs nothing more than your recognition.